After all this knitting, I realized I was neglecting crochet horrendously. 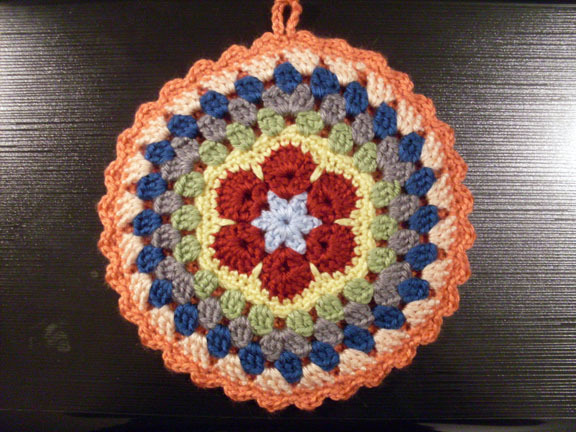 I therefore looked up a new pattern that I hadn’t tried yet and made an ornamental potholder! Ta-da! 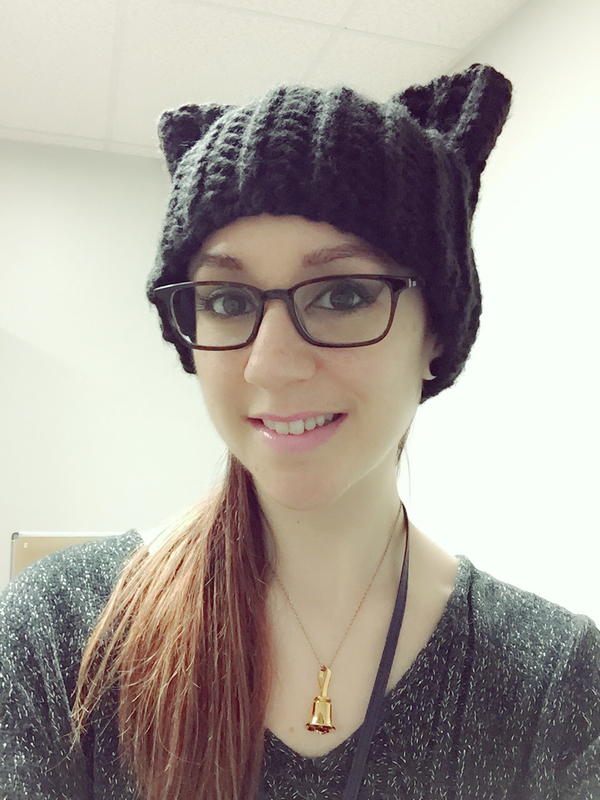 I found this on Ravelry, which sent me to this original pattern from Crochet with Raymond. 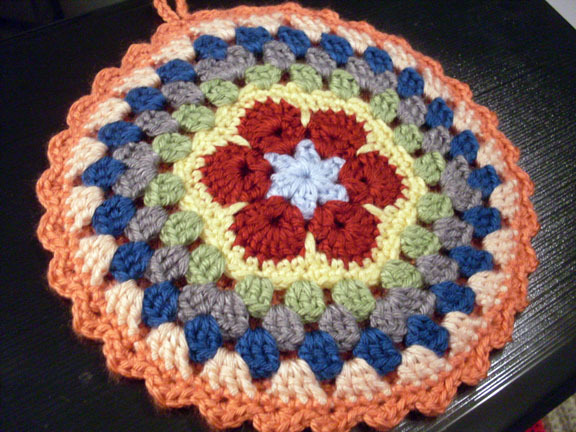 I did a few things in the pattern my own way, like centering the granny increases in row 7 to be above the petals, but I really do like this pattern! 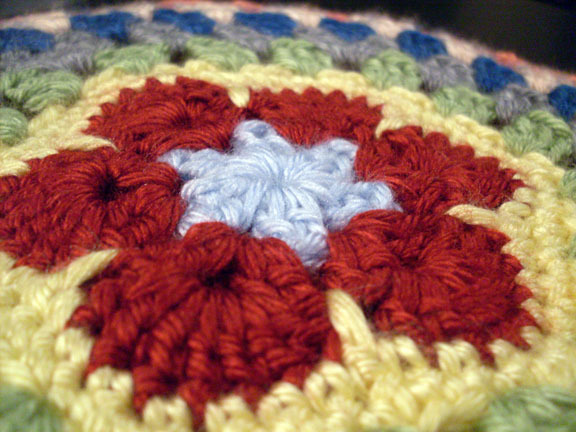 The center motif is called an African flower, and it’s becoming quite popular these days in all kinds of projects. I had a bit of trouble in a couple of places, just being uncertain exactly what the pattern meant, but I think I succeeded. The pattern calls for a back layer, which you can see through the granny gaps, and that really does make it suitable for picking up hot kitchen items. I’m afraid I won’t be using mine for that, however, because I used Caron Simply Soft yarn and I’m scared that the acrylic would melt on my hand instantly on contact with a hot pan, or something like that. Scary. I think I’ll just hang it above my kitchen sink to add some cheer to my dismal 1970s typical apartment kitchen. I might make more potholders soon to hang beside this one — I think they’re really charming, even though the idea of hanging potholders is very old-fashioned. I remember my grandma had some hanging on her kitchen wall when I was little. Although the idea is an old one, I think it can be done in a pretty, modern way. That’s what I’m trying to do, anyway. Let me know if I’m failing. It just seems so cheery and homey, which I’ve been big into lately. Well, I’m out for the night — it’s past 2 am here and time for bed!